A PIC can't source more than 25mA, so how do I turn on/off a relay? With a transistor! Many microcontrollers cannot source enough current to feed the control coil. 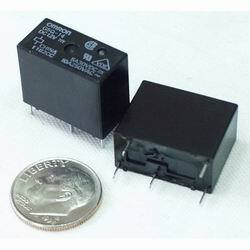 So Q1 is any old BJT (2N3904 is a good one) to turn on/off the relay. When switching large loads, you can get something call fly-back current. The fly-back current can cause surges of voltage when a device is kicked on/off (imagine when the lights dim when you turn on the microwave). These surges can arc and destroy nearby components. The diode 1N4148 (simple, cheap, can handle ~200mA current) is there to direct the fly-back current to a safe path. Without that diode, the flyback current could arc and destroy some nearby component. Be sure to watch how you polarize your diode. This page was last modified on 25 August 2011, at 14:32. This page has been accessed 62,950 times.